Whether you're hoping to receive a unique engagement ring from someone special or you're a guy trying to decide what style of ring to pick out, heart-shaped gems and settings are unusual and interesting. Some find them gorgeously meaningful while others think of them as obvious and tacky. If you're not sure whether you think these rings are lovely or lame, give some thought to both sides of the debate. You'll find it mostly comes down to personality. Wonderfully Symbolic or Overly Sentimental? Some women feel the symbolism of the heart design is incredibly beautiful. After all, a heart is a shape that symbolizes love, and that's why you're getting engaged. Others feel the symbolism is too obvious and emotionally flashy for their taste. If you're shopping for a ring, consider the personality of the person wearing it. If she's proud of her emotional nature and wears her heart on her sleeve (so to speak), a heart-shaped gem is far from tacky. If she's more reserved, she may find the design too sentimental. There's no denying heart-shaped gems are getting attention lately, especially among celebrities like Blake Lively and Lady Gaga, who famously sported heart-shaped diamonds. But does this publicity also mean they will go out of style in a few years? It's an important consideration, since this is a ring that will be worn for decades to come. Diamond shapes and ring settings do go in and out of style, and it's generally the more statement-making pieces that are noticeably out of date many years later. However, this isn't a worry for everyone. If she loves all things classic, a heart shape might not be for her. If she wears vintage clothing and likes to keep things interesting, she might love a heart. 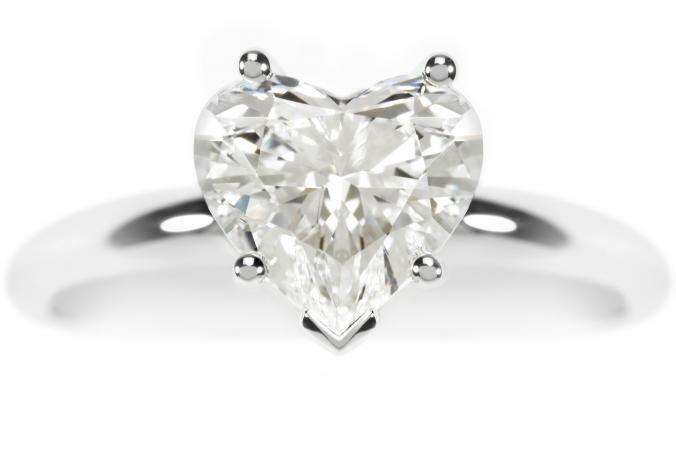 The heart shape is fairly rare when it comes to engagement ring gems. In fact, Town and Country Magazine reported heart-shaped diamonds are some of the least popular, accounting for only 0.82 percent of diamonds purchased each year. This means when she wears her ring to work, she may well be the only woman with a heart-shaped gem in her office. Is she comfortable being unique and standing out from the crowd? If so, she may love the rarity of her ring. If not, she may prefer a more traditional style. Cut quality - According to Brilliance, it takes a huge amount of skill to cut a gem into a heart shape. The symmetry must be perfect, and only a very talented gem cutter can do this successfully. Always ask to see the actual gem before you buy it or have it checked by a gemologist. Colored gems - There's no need to limit yourself to a diamond for a heart-shaped gem. Don't rule out colored gems like rubies and pink sapphires, which can add even more style to this look. Just make sure you keep the rest of the setting simple since the gem itself will attract attention. Timeless settings - Because this is such a statement-making gem shape, don't choose a setting that will compete for attention or overpower the gem. A simple halo of small diamonds is fine for a smaller center gem, but avoid too much filigree or multiple colors of gold if you want to keep the look sophisticated. Heart settings for round gems - If you want to avoid the heart-shaped gem but still have the symbolism of the heart shape, you can select a setting that calls this up. Some jewelers offer heart-shaped settings for round or other shapes of gems. This may be a good compromise if you're not sure you want a heart-shaped diamond. Rose gold - Rose gold, which has a warm tone due to the inclusion of copper, can be a subtle and lovely addition to a simple heart-shaped engagement ring. It adds warmth and sets off the heart design without being too flashy. Ultimately, heart-shaped engagement rings make a statement about love and style. They aren't for everyone, and some people will find them trendy and unsophisticated. However the bottom line is if you love them, they aren't tacky at all.